On the third Saturday in January for the last two years, tens of thousands of San Diegans gathered, joining millions across the nation, in an unmistakable show of solidarity and continued commitment to stand together and raise our voices in resistance. It is and continues to be an important reminder that hope for a better future is all around us. This year’s theme, “Truth to Power,” means raising our voices, even when we are afraid, and is focused on lifting up people whom we observe as Truth to Power Champions in our community. Still, questions have arisen regarding the future of the grassroots Women’s March organizations, of which there are hundreds around the country. Nevertheless, the Women’s March San Diego team thinks this movement is more important today than ever, here’s why. The power of the Women’s March to unite our voices, instill hope, and ignite action is unmistakable. Everywhere we go, you share your march stories with us: you marched with your children, parents, and friends. You shared what the march meant to you, and how it left you feeling energized, less alone and more hopeful about the future. Your stories kept our team fueled as we built our team, shared our strengths, developed trust in one another, and lifted up the good work of other organizations in our community. When other grassroots movements looked to us to support their marches, we worked collaboratively to support their efforts. We marched with them. Our partnership with the League of Women Voters helped us to organize ourselves and created common goals toward which we worked, alongside so many critical organizations and individuals. The historic mid-term elections resulted in unprecedented gains for women at the local, state, and national levels. Your hope was our hope. Now and throughout the course of history, we have witnessed land stolen from indigenous communities in the name of profit. Our hearts were heavy at every show of mass violence in 2018, our rage anew at the sustained demonstration of police brutality and countless incidences of black or brown and mentally ill individuals being shot. The rise of newly emboldened antisemitism, efforts to dismantle rights of the LGBTQIA+ community, and efforts to erase trans people from our midst, reminded us that gains can be lost. The rise of cruel immigration policies, of family separation, abuses and deaths of immigrant children and the continued vilification of immigrants found us scrambling to respond. Harbingers of climate change left us helpless as our neighbors picked up the pieces of their lives in the aftermath of fires, hurricanes, and earthquakes. Dr. Christine Blasey Ford, and so many women like her, showed credible claims disregarded–evidence of systemic misogyny that regards survivors as less valuable than those who would victimize them. All of this, and more, fueled our passion, and we saw it fueling yours. Meanwhile, the insensitive and often contemptuous responses from the current administration left us outraged, but not surprised, and we united in our collective despair. We are an all-volunteer team, whose work is linked by our common experience of womanhood. We embrace a philosophy of support for others, even if our approaches to social justice take different paths. Our unity principles embody social, economic, and environmental justice, and when we found them lacking, we revised them. As such, they have been updated to express an explicit rejection of antisemitism. We are stronger together and are finding our path to a new way of solidarity that respects and embraces the intersectional identities and experiences of women. While diverse, we acknowledge there are essential voices missing from our table. Our team includes women who are Asian-Pacific Islander, biracial, indigenous, Latina, Indian and white; we are members of the Jewish community, LGBTQIA+, people with disabilities, and we are parents to children with these identities. We commit to doing better to ensure full representation of our community, and we invite you to join us in this effort. We believe diversity makes us stronger, and that we are stronger together. In reaction to the presidential election of 2016, hundreds of Women’s March groups across the country answered a call to action to unify, adopted the logo, held a vision and messaging — all without a formalized relationship. Women’s March San Diego does not share leadership, structure, or funding with the national Women’s March Inc. chapter and does not have any input or control of their decision-making or leadership. Media organizations have focused on the issues the national organization is facing related to antisemitic and anti-LGBTQIA+ charges. You have voiced your concerns as well, and we have heard you loud and clear. In response, Women’s March San Diego released a statement on this issue last March and again in November, and worked closely with Women’s March California to draft a joint statement. These points of clarification are important, and we urge continued support of the grassroots efforts of Women’s March teams across the nation as they work to achieve social and policy changes that are fair and just for all people. As individuals and as an organization, we believe these growing pains are necessary and healthy. This is why the Women’s March is so critical. It is why we march and hope you will, too. 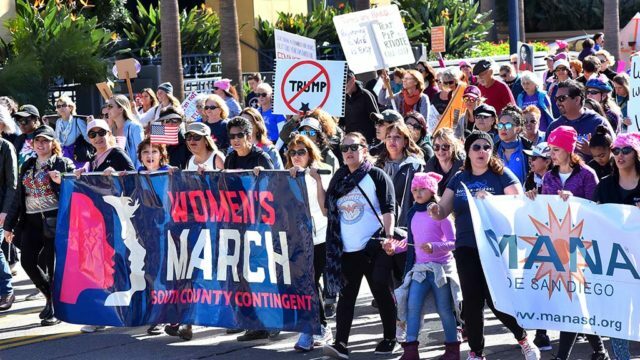 This article was written by Monica Boyle, Frances Carrillo, Dr. Poppy Fitch, Amy Epstein-Swazey and Genoveva Aguilar as members of the Women’s March San Diego executive board.